After you listen, make sure to check out our notes below for important links mentioned within the podcast! Is it something you love, or something you think will make you money? Is this both financially and emotionally satisfying? Stick to a schedule. Daily, Weekly and Monthly routines. Documentation Is Key. Taxes, Client Orders, Invoices & Expenses. Backup daily in multiple places. On your hardrive, on an external drive and in one or two cloud drives. Google Drive, Amazon Cloud and Dropbox are great options. Get serious. Stop treating it like a hobby you can do when you feel like it. Create Business accounts. Get a Tax ID number, LLC, Bank account, Paypal account, etc. Treat clients like you would your boss in a regular office. Complete deadlines, behave professionally and respectfully. If you have further questions about how to be a successful work at home entrepreneur, feel free to message us at [email protected] or leave a comment below! We have years of experience, debt being paid off, time management tips and more to share with you! Check out our Work From Organization Tips post for more helpful hints to keep you on track with your home business! 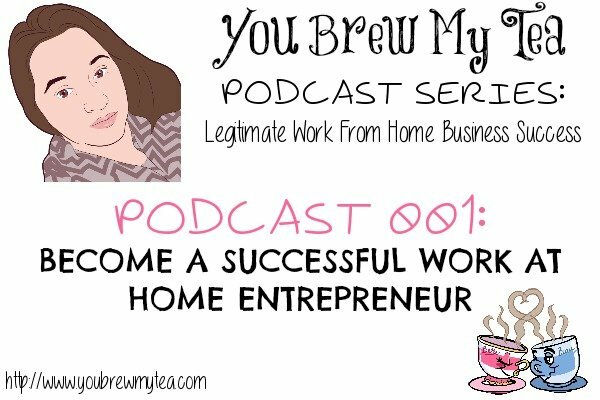 Great podcast, I work with a lot of stay-at-home entrepreneurs and these are all very good tips. Thank you! Treating it like a business is what most miss. And that means more than organization, it means responding to inquiries in a professional tone (and promptly) as you would expect any business to. This is really great. I started listening but bookmark to finish. i love working from home, makes it so much easier since i have a lot of doctor appointments. Fantastic podcast Katie! You have such a professional voice as well– you could be on radio. Tons of great information as well.